LSU has not averaged so few points a game in a season since 2009, when it finished No. 10 in the SEC and No. 76 in the nation with 24.8 points a game. BATON ROUGE — Of all the offenses in all of college football, and LSU was the one trying not to score in a game at Arkansas Saturday night? Offenses with such trouble scoring to begin with perhaps should not try not scoring on purpose for strategic reasons late in a game. No. 7 LSU (8-2, 5-2 Southeastern Conference) enters its 6:30 p.m. game (ESPNU) Saturday against 44-point underdog Rice (1-10, 0-7 Conference USA) No. 85 in the nation and No. 8 in the SEC in scoring with 26.7 points a game. More troubling are LSU's numbers and rankings in total offense, pass offense and quarterback efficiency. The Tigers are averaging 362.4 yards a game for 11th in the SEC and 103rd in the nation in total offense under first-year offensive coordinator Steve Ensminger, who held that title on an interim basis in 2016. LSU has not averaged so few yards a game since 2011 with 355.1 under offensive coordinator Greg Studrawa. LSU is No. 12 in the SEC and No. 100 nationally in pass offense with 192.3 yards a game this season. That's 11 yards behind the pace of last season when the Tigers were No. 8 in the SEC and No. 84 nationally with 203.5 yards a game under first-year offensive coordinator Matt Canada, who was fired after the 2017 season. Transfer quarterback Joe Burrow, meanwhile, is 13th in the SEC and 96th nationally in efficiency at 118.1 on 153-of-279 passing for 1,923 yards and seven touchdowns with four interceptions. That is the worst efficiency rating for an LSU quarterback since Jordan Jefferson was No. 92 in the nation and No. 11 in the SEC at 114.65 in 2010 under offensive coordinator Gary Crowton on 118-of-209 passing for 1,411 yards and seven touchdowns with 10 interceptions in 13 games. Burrow's seven touchdown passes in 10 games and 10 starts this season is the lowest since Jefferson threw six in 10 games and five starts in 2011. Burrow is also 35 efficiency points and nine touchdowns behind 2017 starter Danny Etling, who finished No. 5 in the SEC in efficiency and No. 13 nationally with a 153 rating on 165-of-275 passing for 2,463 yards and 16 touchdowns with two interceptions. "Joe's had some really good games, and he's had some OK games. And he knows that. He's a competitor," LSU coach Ed Orgeron said. "I don't know what it is, but I'm excited to get back on the practice field," said Burrow, whose 40-yard touchdown pass to wide receiver Justin Jefferson in the 24-17 win at Arkansas Saturday was his first since the Ole Miss game on Sept. 29. Burrow completed 15 of 21 passes for 195 yards at Arkansas, but was sacked three times and lost a fumble. "It felt like we were sluggish," he said. "It felt like we got complacent." Burrow is LSU's fourth starting quarterback since the beginning of the 2014 season — Anthony Jennings (2014), Brandon Harris (2015) and Danny Etling (2016, '17). There has been little continuity at offensive coordinator as well. 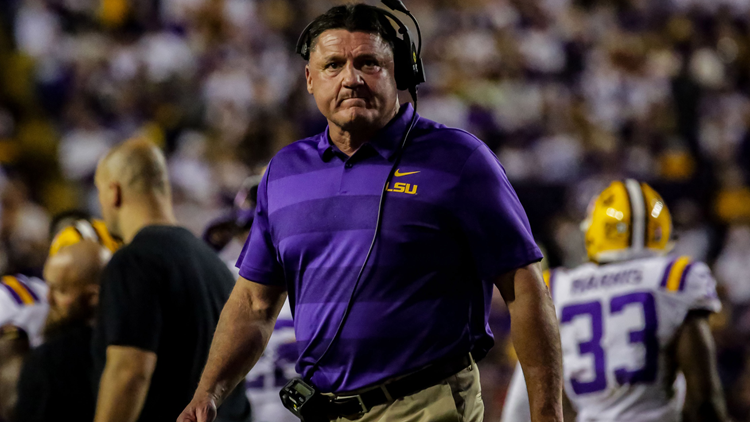 Ensminger is LSU's fifth offensive coordinator since the beginning of the 2011 season — Studrawa (2011-12), Cam Cameron (2013-15, four games in 2016), Ensminger (eight games in 2016), Canada (2017 with Ensminger as tight ends coach) and Ensminger (2018). But the numbers have remained largely the same. LSU's offense has struggled for three straight games now. Since gaining its second most yards this season with 475 in a 36-16 win over No. 2 Georgia on Oct. 13, including Burrow throwing for 200 and rushing for 66, LSU has averaged 264 yards a game, which would be last in the SEC by 80 yards. After rushing for 96 net yards against Ole Miss and 66 against Georgia, Burrow has managed just 8, -7 and 15 rushing yards in his last three games. "I think some how, some way, we lost our identity since the Georgia game," Orgeron said on Monday. "We're trying new things. Maybe we're trying to get a little too cute, put too much in. We need to simplify." Orgeron criticized Canada in similar fashion early last season and inserted Ensminger more into the offense, resulting in a loss to three-touchdown underdog Troy and a feud between Orgeron and Canada the rest of the season that turned into a firing. "I asked Steve to go back and look at the Georgia game and figure out what we did right there because we were clicking pretty good that game, and let's look at the things that we did," Orgeron said. "I think it's more or less to simplify. We're putting too many things in. Are we trying to cover up some things that are some weaknesses, maybe? Maybe sometimes we feel like we're handcuffed." After sophomore wide receiver Justin Jefferson, who has 42 catches for 669 yards and three touchdowns, LSU's second leading receiver is Dee Anderson with only 18 catches. Highly recruited and much ballyhooed true freshmen receivers Ja'Marr Chase and Terrace Marshall Jr. have only 21 catches between them. "We can't get as many receivers out as we want to or something like that because of protection, or whatever it may be," Orgeron said. "But I did ask him to go back and look at the Georgia game, simplify, and we're going to do a lot of that stuff and look at what he guys are doing to us on defense — the defenses that are giving us problems. We need to have answers for those defenses because we're going to see them again." LSU's screen passing was better earlier in the season. "It's not working now," Orgeron said. "We have to do some things different to help us in the screen game." Rice could help LSU's offense drastically. The Owls are 126th in the nation out of 129 upper level schools in pass defense efficiency at 167.40 with 25 touchdowns allowed against six interceptions, and they are 111th in pass yards allowed with 268.8 a game. Rice is also No. 101 in total defense with 441.6 yards allowed a game. Texas A&M (6-4, 4-3 SEC), which hosts LSU to close the regular season on Nov. 24, is last in the SEC and 113th in the nation in pass efficiency defense at 152.8 with 19 touchdowns allowed against three interceptions. The Aggies are also 12th in the SEC and 104th nationally against the pass with 256.5 yards allowed a game. "I expect Joe to play better," Orgeron said. "I would expect him to pick up his game the next couple of games."